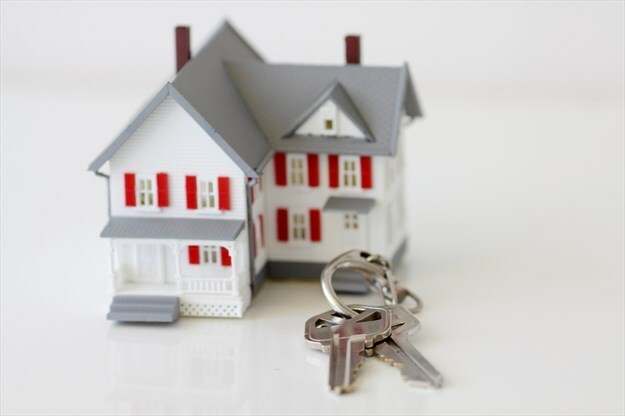 A recent report shows that Waterdown is the second least affordable neighbourhood to buy a home in the City of Hamilton. 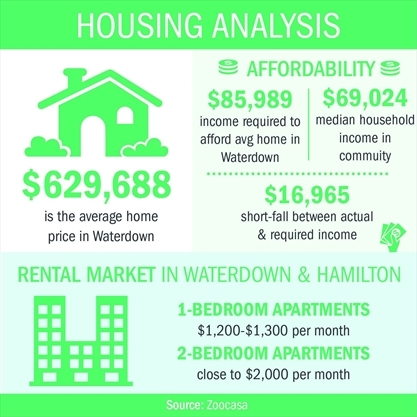 The report, released by real estate agency Zoocasa earlier this year, found that Waterdown trailed only Ancaster in terms of affordability among 27 neighbourhoods across the city. As of December 2018, the study found that the average home price in Waterdown was $629,688 and the income required to afford the average home was $85,989. However, the median household income in the community was $69,024, leaving a shortfall between actual and required income of $16,965. The calculations were based on a buyer qualifying for a 30-year mortgage at 3.35 per cent, with a 20 per cent down payment. But the high cost of housing in the community doesn’t only impact home buyers — it trickles down into the rental market, making everything across the board more costly. Tom Cooper, the director of the Hamilton Roundtable for Poverty Reduction, said people don’t often think of Waterdown when discussing poverty or affordable housing — but that doesn’t mean the issue doesn’t exist in the community. “The challenges of poverty are not exclusive to the inner city of Hamilton,” he said. “We’re seeing poverty in all parts of the area — and across Ontario. Cooper said a lack of affordability in housing is a profound problem in Flamborough. By contrast, Cooper said most housing experts peg about 30 per cent of your income as a fair amount to pay for housing. He said the high cost of housing across all parts of Hamilton is causing people to make impossible choices — such as whether to pay rent, feed their kids or keep the utilities on. The most recent rental market stats from the Canada Mortgage and Housing Corporation bear out the rising costs of renting in the city. While Flamborough and Waterdown are grouped with Ancaster and Dundas in the data, stats show an average increase of $80 per month from 2017 to 2018.
Cooper said the spike in rental costs is telling, because many housing advocates think CMHC underestimates the availability and cost of rentals. It’s common to see one-bedroom apartments in Waterdown — and city-wide — going for $1,200 to $1,300 per month, while two-bedroom units are getting close to $2,000 per month. It’s something Flamborough Food Bank managing director Jim Leamen said is a common concern for the organization’s clients. Leamen said a number of the food bank’s clients work in Waterdown, and most jobs within town are minimum wage. He said the increased housing costs, in combination with Waterdown’s growing identity as a bedroom community of Toronto, has created a large housing gap. While Flamborough and Waterdown are generally seen as more affluent communities, Leamen said the Flamborough Food Bank had 139 registered families in February, and is seeing an increase in clients every month. He noted a registered family is one that has used the food bank within the last 12 months. While the food bank doesn’t turn anyone away, they are focused on the rural area. But Leamen said clients come from Cambridge, Hamilton and Waterdown. He said the Food With Grace Waterdown Food Bank is open from 2-6 p.m. on Tuesdays. Anyone who can’t make it during those hours can visit the Flamborough Food Bank, which is open Wednesdays from 1-3 p.m. and 7-8:30 p.m. In speaking with clients, Leamen said housing pressure is a huge issue — both in terms of cost and the lack of options. “With real estate (prices) rising, people who otherwise might have rented their house are now putting it on the market and pushing these people out the door,” he said. So what’s the solution to the ever-increasing cost of housing and the lack of affordable options? For Cooper, the only way forward is massive government investment in affordable housing. In the 1960s and 1970s, Cooper said government invested heavily in affordable housing. But in the last 20 years, since the cancellation of the national housing strategy, that hasn’t happened. There have been a great deal of private homes built, but Cooper said that isn’t translating into affordability for lower income individuals. While the federal government has committed to a new national housing strategy, Cooper said the funding for that program won’t roll out for several years — and could be dependent on the outcome of October’s federal election. “From my perspective, I think we really need the senior levels of government to step up,” he said, adding the City of Hamilton has done some interesting things in the affordable housing field — but stressed the city’s budget is limited. Mayor Fred Eisenberger and Ward 5 Coun. Chad Collins have spearheaded a plan to direct $50 million in hydro dividends to affordable housing over the next 10 years, something Cooper said is a great first step. Cooper said there is an even greater challenge in Flamborough and Waterdown because there is less affordable housing stock available. The lack of affordable housing is a challenge Ward 15 Coun. Judi Partridge hears about constantly. “I hear it from seniors, I hear it from young people — it really is a big issue,” she said. But solving the problem is difficult, Partridge said, because the key to building affordable housing is having land to build on. That’s especially true in Waterdown, Partridge said when the city doesn’t own any excess land, apart from parkland. For her part, Partridge said she thinks the solution can be found in partnerships — working together with providers of affordable housing. Partridge said she has had discussions with Indwell and other organizations, but stressed the key is finding property they can purchase. “Within the town itself, there’s not a lot of available land that is affordable,” she said. “If you can find an empty lot — which is pretty tough to come by or a lot with an older home on it — you’ve got the high cost of that property. Partridge said all of those factors can make it unaffordable to build affordable housing. The lack of available land is a problem the Rotary of Club of Waterdown is grappling with. President Sue Collins said the club is acutely aware of the lack of affordable housing in Waterdown — and housing options in general. Over the past year, the club has been interested in a project that would help with the need — but have been unable to secure property on which to build. “We have identified affordable housing as a major need in town and we’re wanting it to be our major project,” she said. Collins said the club has some “street cred” in the affordable housing sector, having built and managed affordable seniors housing at Rotary Garden Court since the early 1970s. Collins added the club is a major donor to the upcoming Waterdown Habitat for Humanity Build. “But we’d like to have a project that has our name on it,” she said, adding the lack of a property is a stumbling block. Collins stressed that Waterdown needs a balance of housing options. “The community needs to offer everybody something,” she said. “I’m particularly conscious of seniors who have to leave the community if they can’t afford to be here and have lived here all their lives. Partridge said she has an ongoing dialogue with new developers about designating a portion of a new building as affordable or geared-to-income housing. “At the end of the day, for those developments, it is about making money and it is about building as many units as they can,” she said. “There has to be buy-in there and it has to be doable. Still, she’s holding out hope that discussions with developers about building new affordable housing in the community will bear fruit — at some point.